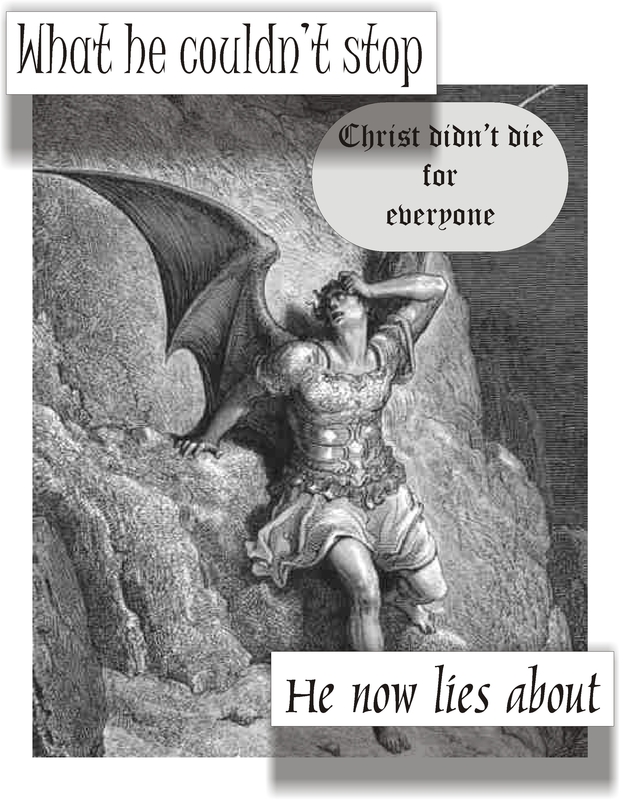 Showing how Calivinism teaches a heresy when they say Christ did not die for all mankind. If God’s righteousness is displayed in the heavens, modern science has been showing us how vast is His righteousness. Through the innovation of technology we get to look light years into deep space see how the heavens declare the glory of God. Man has learned how precise God has put the heavens together. If we were but a little bit closer to the sun life would not exist on earth. If we were but a little bit further from the sun, again we would have no life on earth. If the earth axis and rotation was not what it is, we would not have the weather we do have making life impossible again. If our solar system was closer to our galactic core than it is we would have too much exposure to the violent nature of the cosmos. We seem to be tucked away very nicely in the exact location and circumstances that we need to be in for life to exist. We see this same precision when we look at the atomic level. If the electron rotated any slower or faster around the atom we would have no atoms. If the nuclear bond was any weaker or stronger we would have no atoms. I have not tried to be technical, but in the simplest way show how God has done a very precise work that can not and should not be altered if mankind or creation is to exist at all. Do we now go from the vastness of the created universe with all of its precision and working laws of science, that God has put in place, and zoom down to earth to a book and declare His work in this book is not exact? 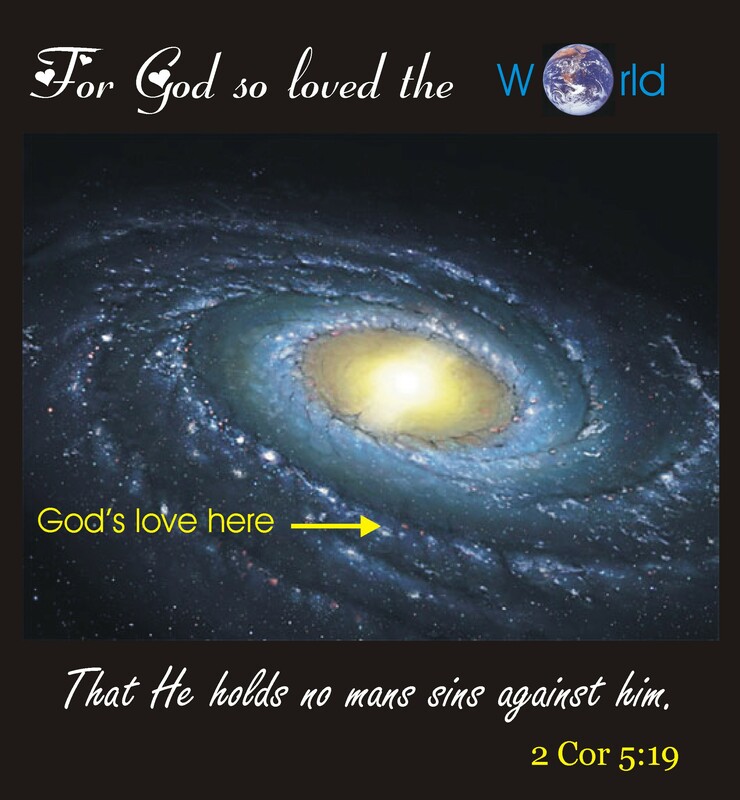 Are we to believe God is exact in His creation that declares His righteousness and glory, but in His book that declares His love it is not so exact? Believe it or not there are Christians who advocate this very thing when they teach the doctrine of men. Can you believe that men actually teach that John 3:16 doesn’t mean what we read? 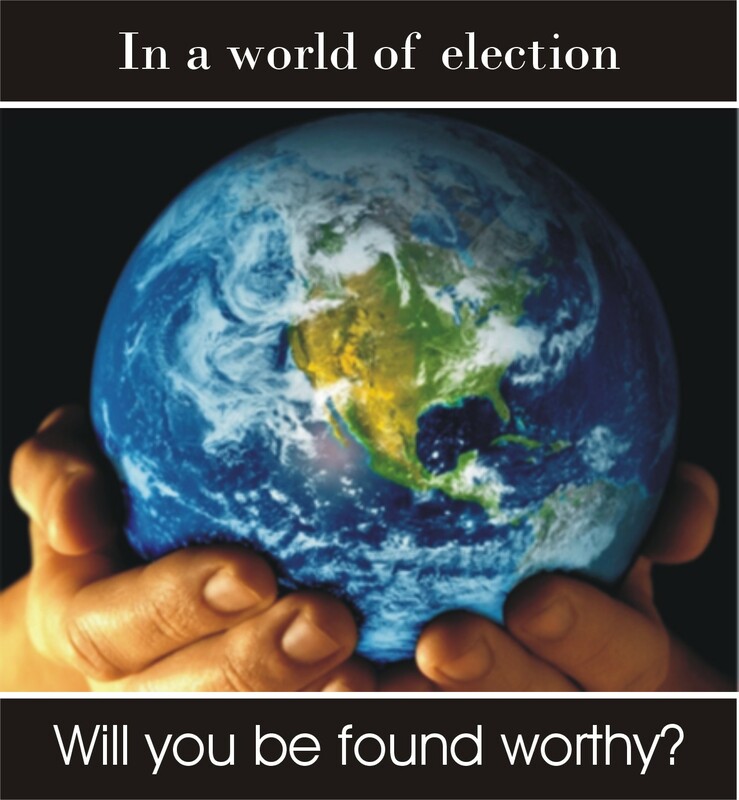 Through a perverted doctrine concerning election they advocate that God did not send His son to the world but to those elect who are in the world. They teach that whoever does not mean an open invitation to all mankind to receive Christ, but only the elect. They throw out all kinds of reasons and equally unbiblical uses of scripture derived from the reason of man to support such a position. Through the reason of man they want us to believe that God did not send His Son to the whole world and that an open invitation is not given to all mankind. That world doesn’t mean world and that whoever doesn’t mean whoever. We can see the in the simplest way that God is precise in what He has done to establish a home for mankind in the heavens. We can see His exacting handiwork even in the examination of the smallest details found in the atoms. And this incredibly accuracy is found in something that is temporal and will be burned up. Yet in His word we have believers that assume God can not and has not communicated His love to us with such accuracy in His eternal word. These same believers want us to believe that “if” doesn’t mean perhaps or the place of decision but rather to mean “since”. By hold to and advocating their doctrines upon the hearts of men who would put their hope in Christ, they offer a twisted convoluted idea of God’s love to mankind. I urge believers to trust God to mean what He says and say what He means in His word. If God is able to hold creation in His hands with such precision, is He not able to hold His word in His hands with such precision too? Men will take you down roads of reason and doctrine that starts out biblically but then will imply or say stands to reason. I say. let’s just stick to what the text says. For God so loved the world that He gave His Son, our Logos, to us in perfection so that in His open invitation to mankind He is willing that none be lost when we as sinners repent and put our hope in Him. Be encouraged, those who were burned at the stake during the reformation did not die in vain as they laid down their lives so we can read the scriptures in our own language. God who is the originator of language did not cut Himself or the representation of Himself out of His word in our translation. There is no hidden meaning in the word “world”, “whoever” or even “if”. We can trust the Holy Spirit to teach us all things in Christ. We who trust and believe God at His written word are like David who apposed not only a giant, but a whole nation who had God figured wrong. So be bold in the Holy Spirit and proclaim the written word of God as the Holy Spirit reveals it to you in opposition to the more educated and established institutions built on the doctrines of men. Remember the exactness of His temporal creation, God’s love communicated to us is even more precise. Calvinism teaches that there are those people that God has not sent His Son to die for. Their doctrine actually teaches that God has chosen men to die in there sins because God did not send His Son for them and they call this election and predestination. Why do they do this? Because nothing that God does would be less than 100% realized. So if Christ died for all mankind, and not all receive Him then His efforts are not 100% realized. In “Disarming Calvinism (part six)” I will demonstrate that God has not chosen some men for glory and some men hell. I will disarm the Calvinistic idea that suppresses the compassion of God who does not wish for any man to die his sins. 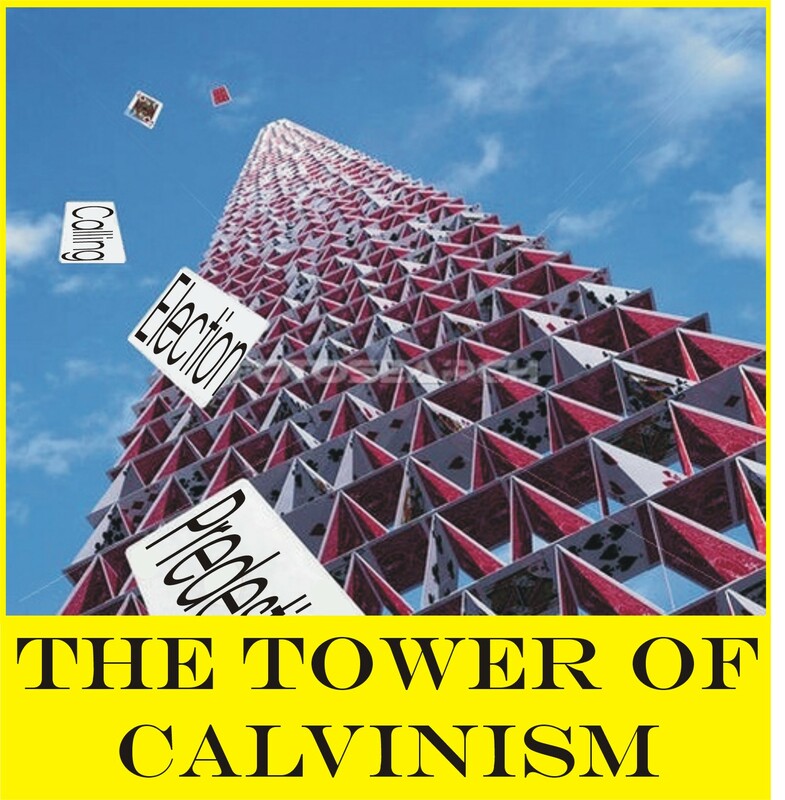 Calvinism is wrong when it teaches that only some men are elected for salvation and others are not. This is the end of my six part series on Disarming Calvinism. To understand the biblical basis for my summation please read the entire post in order to follow the scriptural evidence I lay before you. Some how Calvinist think they show the greatness of God by teaching that God in His great mercy has elected to only save some of mankind, knowing that none of mankind is worthy to be saved. Therefore He displays His great benevolence in predestining some of us to be saved. Calvinist also think they show the greatness of God by teaching that nothing that God puts an effort to is done in vain. That it follows that Christ would not die for someone who would never come to a saving knowledge of Him. That He is so mighty and we being without free will can not resist Him or His will for us. Those who do not come to accept Him as savior were never predestined to receive God’s grace. These people who die in their sins never had Jesus die for their sins, have their sins forgiven nor imputed righteousness. And this is how Calvinist think they show the greatness of His benevolence, His mercy and His love. Well I glasseyedave, the upstart that I am, believe that there is a better way to show these attributes of God’s character and this from a truly Biblical perspective. That is to say in the perspective of The Gospel According to the Gospel. God shows us plainly in scripture that He from the time of Abraham had selected one man and his descendants to show Himself to and to be their God and they to be His people. To consummate this unique relationship with His creation, God imputed to Abraham and his descendants His righteousness with the sign of this covenant and righteousness being circumcision. So the entire nation of Israel was elected, predestined and imputed righteousness to be a light unto the gentiles and a vessel that God would reveal Himself to the world. Now in these last days, God has chosen His Son to be the vessel of His wrath to take away the sins of the world. Through Christ we gentiles get to participate in the blessings given to Abraham. We through our savior get to participate in the righteousness imputed to Abraham and his descendants as we become the spiritual children of Abraham. But just as the biological children of Abraham did not receive by faith their imputed righteousness and sought it through obedience to the Law, they rejected the righteousness of God. They further rejected His righteousness when they sought out other gods. But what we see is God giving unmerited favor to a whole nation of His people with only a remnant to be saved. Now this goes completely against the Calvinist idea of free will, election and predestination. For the people of election after being imputed righteousness had a choice to live for God or reject Him. Moses gave them a choice of blessings or cursings. God predestined the nation of Israel to receive the covenant of imputed righteousness which many if not most rejected. So we learn from scripture that predestination is not a shoe in. Nor is election and having your sins wiped away by covenant as if they never were. Now fast forward to the New Testament were Calvinism teaches contrary to the example of the people of Israel that we have not bettered, but have been grafted into though Christ. They to the contrary of what is taught us in the New Testament believe that only those who will make it to heaven are imputed righteousness, have been predestined and called by God’s election. But we have nothing on what God gave his servant Abraham or His descendants. So how can we teach that our relationship with God is different than theirs? Remember we are the ones grafted into the root not the root to us. Christ paid for all of our sins and we have all been imputed grace. All of us believer and those who will not receive or live by the grace of God have been imputed this righteousness. The question is who will live by faith and obedience. So we actually find that God demonstrates His character better by dying for all mankind. Predestining all of mankind, through Christ, to be reconciled to God through imputed righteousness. His calling is for every man, woman and child. For He is not willing that any should be lost. It is not that God dies only for those who receive Him, His love is so great for us that He dies for us even when we hate him so much as to despise what He has done. His love for us is so great that He has predestined the whole world to be reconciled to Himself and now He is calling us, He is calling you.